Our Custom Vinyl Stickers are a perfect display option for all images and graphics as we custom make each order in accordance to customer specifications. These Vinyl Stickers are digitally printed and then are cut into individual stickers using a computerised graphtec cutter. We only use the highest quality of vinyl and solvent ink in our Sydney factory, so these product are suitable to be use at any indoor or outdoor location such as your car, construction site, product packaging or even at your next birthday or community event. 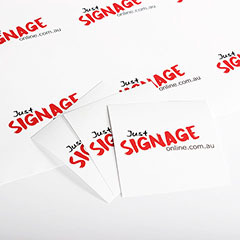 At Just Signage Online we pride ourselves on offering the greatest range of customisation options at the lowest cost. We offer digitally printed graphics using either your own graphics or you can use our in-house designers.